Pantograms announces the addition of Fancyworks Studio to their growing line of software for embroidery hobbyists and professionals. 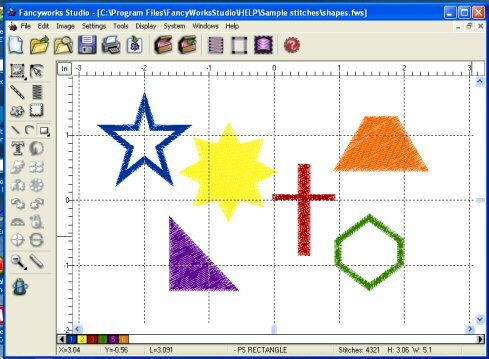 This exciting software adds more tools for digitizers who want to create embroidery designs for their sewing projects. Fancyworks Studio incudes 13 pre-set shapes, 10 fonts, 11 fill patterns, and decorative stitches for quilters and embroiderers. Its ability to save in formats suitable for most home embroidery machines makes it the most useful tool in your sewing room. 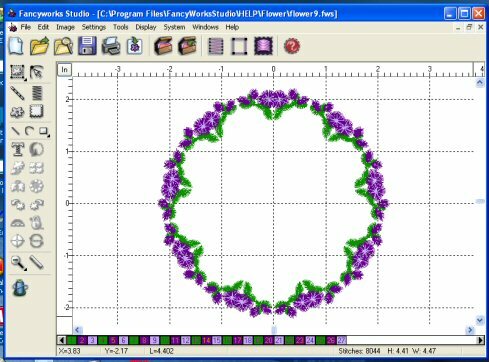 The repeat tool allows the user to create just one section of a design and then arrange copies of it in a wreath pattern. You can add holes to complex fill and even create automatic appliqué designs with fabric placement and tack down stitches already in place. As you work with embroidery files, choose thread colors from major thread manufacturers like Isacord; Sulky; and Madeira rayon, polyester, Burmilana, and Flourescent. Save your designs to the Embroidery Recipe Box where the database maintains a record of your thread choices, design size, and stitch count for future projects. The Recipe Box includes 100 PantoStock designs for your own projects. Watch videos showing the features in Fancyworks. Join a Yahoo group to chat with users of Fancyworks Studio. This program is no longer available. purchased with the link below. Type Library is no longer available.